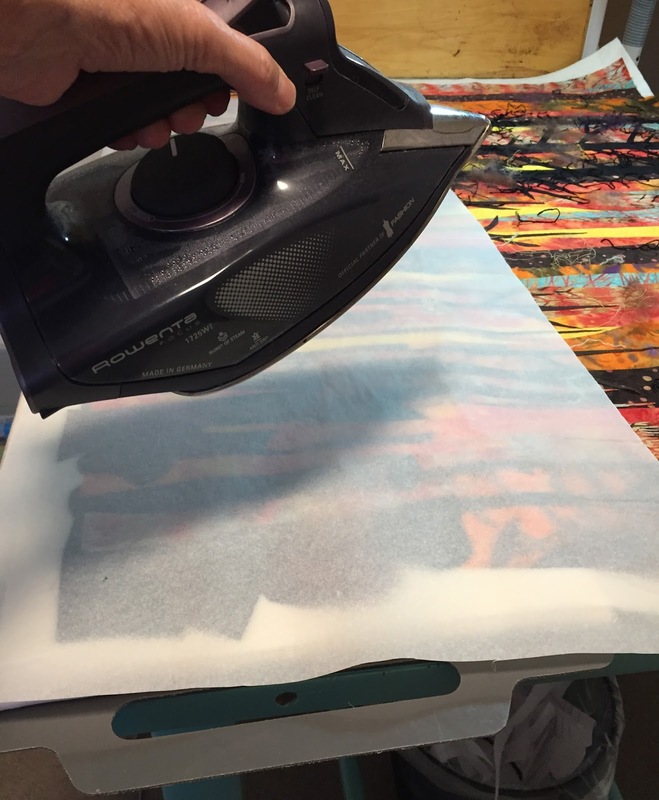 This is a continuation of a previous post on the making of my piece for Heat Wave. In that post, I showed you how I pieced the top portion. 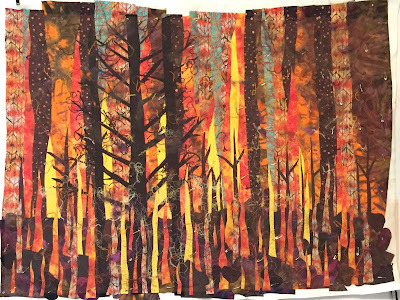 Now I'm going to show you how I did the lower foreground and added the burning trees. I turned to a previous method of adding pieces using fusible products to the both the batting and the back of the pieces. 505 Basting spray was used to attach the top pieced section to the batting. 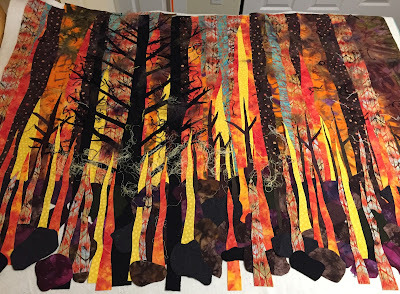 I pulled out the fabrics for the trees, the front vegetation, and the front flames and fused them to Steam a Seam II. 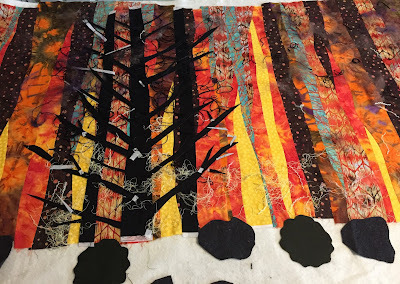 As I randomly cut pieces, I placed them to represent three large black trees and smaller brown trees. When I was satisfied with how they looked, I removed the paper and pressed them in place. Then I randomly cut pieces to represent the vegetation. They are basically big blobs that are overlapped with more flames. You can see the blob shapes below. I worked on this piece on top of my cutting table so that I had a nice large flat surface. However, this made it a little hard to tell exactly what effect I was achieving, so I held my camera as high as I could and took a few shots to help me see the big picture. 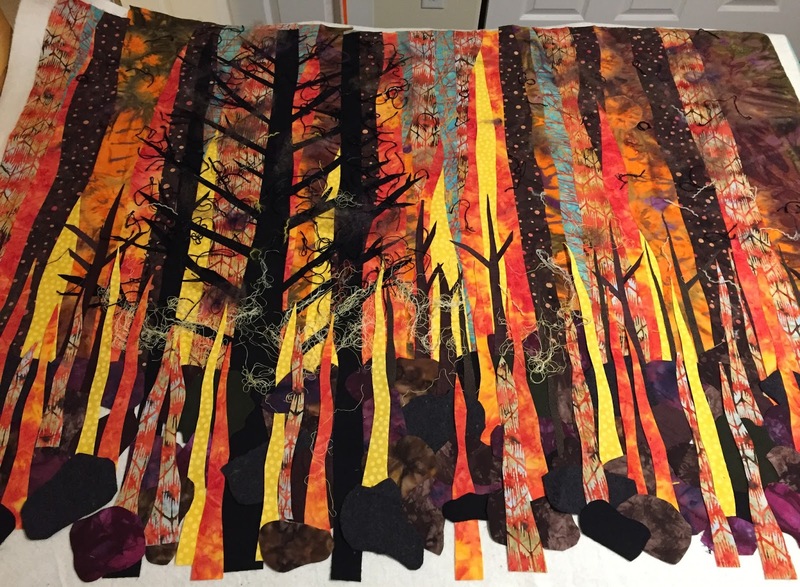 I added shredded yarn, thread, wool roving, and feathers to complete the look of embers and floating smoke. 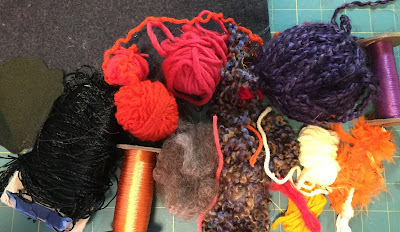 Here is the pile of fibers that I added. I have great friends who save and give me their leftover yarn and thread, and others put things out on our free table at our guild meetings. I covered the whole thing with a layer of orange tulle and pinned it in place. I lifted all of this and put it on my design wall for one last look and picture. We texted the granddaughters to see what they thought. They texted us back and said, "It looks like a fire in the trees." So yippee, it looks like what its supposed to. In my next post, I'll show you some of the thread work and quilting. I really like your piece. 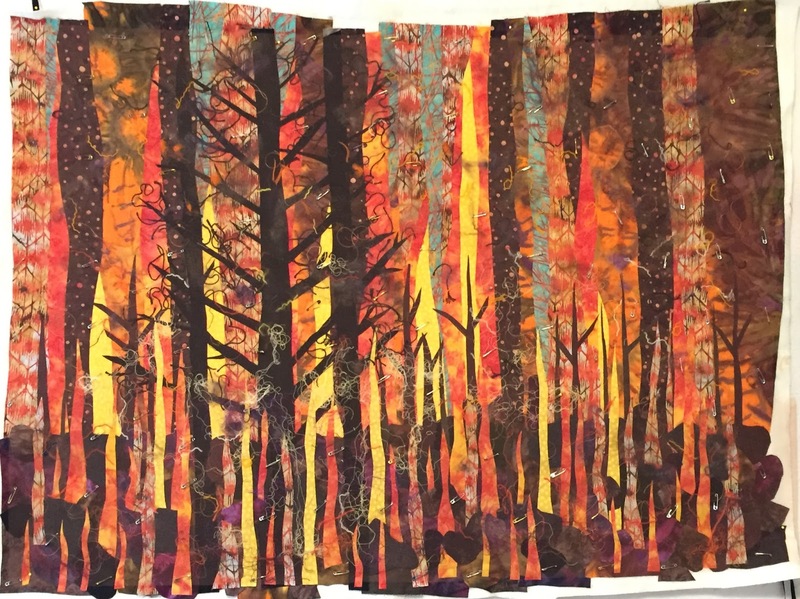 You certainly did evoke the feeling of a forest fire!